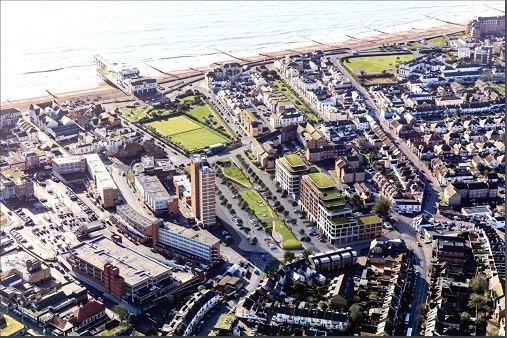 VOTING has been opened to help to choose the name for a new park in Bognor Regis. Detailed designs for the £3m open space are being drawn up. It will transform the Hothamton car park into a modern, urban park created to provide hours of entertainment for all who visit. Arun District Council is giving residents the chance to have their say about deciding a fitting name to reflect the park’s importance for years to come. The proposal includes marketing the western part of the car park to developers for homes and business use. The park has been known since it was proposed as the linear park – but that title is no longer adequate as the plans come closer to becoming reality. An Arun spokesman said: “The final design is now being decided upon. Fully accessible, it could feature a water play plaza, land moulds for imaginative play, a natural play area, a performance area, and an amphitheatre-style tiered grass lawn. “This will sit alongside a central market square with seating, and a cafe with both inside and outside seating. “The park is being designed to host a rolling events programme and could also include a trim trail for adults seeking to get fit, along with plenty of seating. “The site will be well lit so it can be enjoyed after dusk and planting built into the park setting will obscure the parked cars, giving the area the look and feel of a park rather than a car park. Votes can be cast online at: www.arun.gov.uk/bognor-regis-park-poll or in the foyer at Bognor Regis Town Hall.